GUJIAO, Shanxi province -- Three senior officials of a Shanxi coal mine were sacked Monday after a gas blast on Sunday killed at least 74 workers. The Tunlan Coal Mine's manager, chief safety officer and chief engineer have been removed from their posts, Xinhua reported yesterday without revealing details. The explosion occurred at 2:17 am while 436 miners were at work underground in Gujiao, 60 km west of Taiyuan, the provincial capital. Of the more than 300 rescued, 114 were in hospital, five of them in critical condition, Liu Dezheng, deputy director of the Shanxi Work Safety Commission, told a briefing yesterday. An official from the provincial government spokesman's office was quoted as saying that all the miners who were working below ground at the time of the accident had been accounted for and that none was missing. An official from the local bureau of mines was also reported as saying that no one was missing. But anxious relatives who gathered in Gujiao were left in confusion because they were not told if their loved ones were dead or among the injured. Some believe that there are still miners trapped underground, and were pleading for rescue work to be continued. The earliest batch of relatives arrived on the site around noon on Sunday and were sent to six or seven different hotels, motels and hostels, each closely monitored by mine staff. About 50 people were sent to a shabby two-story brick hostel of the Malan coal mine, a Tunlan affiliate. After receiving a phone call from mine officials yesterday morning, the elder brother of 42-year-old miner Li Wuzhong jumped onto a bus for the 200-km journey from Changzhi, their hometown in southern Shanxi, to the Tunlan mine. He was "advised to stay in" at the Malan hostel. "I've been told that Li's unit was down in the pit when the explosion happened," the brother, 53, said. Accompanying Li were 10 relatives, all men. Having been told to wait in a twin-room, they complained about the scant information on their beloved family member. "No one has told me whether he is alive or not," the elder Li told China Daily. The men tried their best to hold back their tears, a typical scene in all the other 18 rooms on the hostel's second floor, temporarily occupied by frustrated relatives. Looking after them were a few nurses, equipped with oxygen bottles and first-aid kits, ready to treat those who collapsed in grief. About 20 employees of the mine - mainly women - were also there, comforting the relatives, while ensuring they did not leave the premises. Back in Tunlan, half a dozen ambulances stood parked outside the pit as a dozen policemen guarded the gates to the shaft. A captain of a special police unit from Taiyuan, who did not want to be named, said they would not leave until compensation for each victim was confirmed and the investigation process ended. He said he had been involved in many similar tasks and had seen the rage with which some relatives protest, normally over scant compensation following accidents in small, mostly illegal collieries. Without any accident reported in the past five years, Tunlan, with an annual capacity of 5 million tons, was considered one of the safest and most advanced mines in Shanxi. 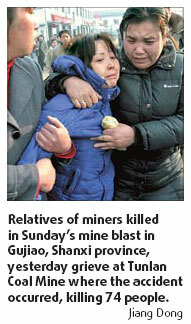 Officials have said the compensation for each dead miner would be "no less than 200,000 yuan ($29,000)". A statement posted on the provincial government website said final checks on the mine were being conducted. "The next step is to double-check the bottom of the well ... treat the injured and properly save all the data in preparation for the investigation," it said.